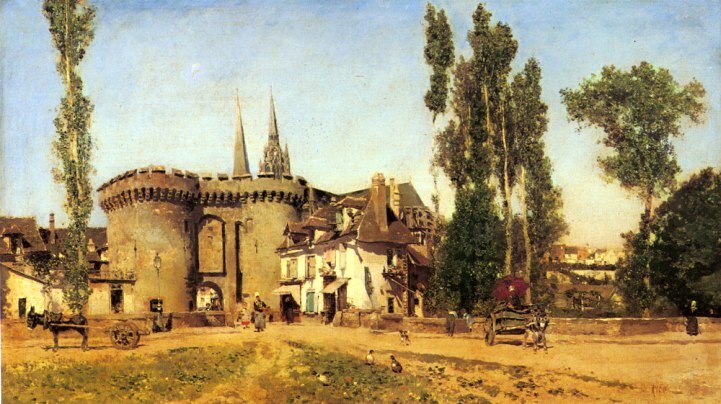 Historical depiction of the French town of Chartres by the famous Spanish artist Martin Rico Ortega (1833-1908). In Ortega’s painting, the city is surrounded by a low wall and accessed through a castle-like structure. In the background you can see the twin spires of the famed Cathedral of Chartres. In the foreground, like we see in so many of Ortega’s paintings, residents and livestock go about their daily business without regard for the artist sketching their daily routines. Ortega is known for his bright skies and strong attention to architectural details and this famous painting is no exception. To learn more about the artist and see more of his work, please visit our Martin Rico Ortega biography.